Bushman Lives! by Daniel Pinkwater. Review: Do you enjoy funny, crazy stories? Recently, I read a book called Bushman Liveswritten by Daniel Pinkwater. The main character of the book is Harold Knishke, and he certainly is a unique character! The story begins with Harold waking up in the middle of the night to find his friend, Geets Hildebrand, sitting on his carpet. They then drink to their hero, bushman the 427-pound gorilla that once lived in the Lincoln Park Zoo. Geets spend the night there and the next morning Harold's mother asks Geets what he plans to do over the summer. Geets says that he might join the navy. After breakfast Harold goes to his flute lesson where his music teacher literally tells him that he stinks, and then he offers to buy Harold's flute. Harold sells his flute and explores Chicago for the rest of the day. Toward the end of the day, Harold sees a boy his age pushing a stuffed gorilla down the street and the boy asks for Harold's help. The boy, Billy Zwieback, tells him that it's for his father's life drawing class. Harold accompanies Billy to the class and decides that he will become an artist. From that point, Bushman Lives is a fun and crazy story that will continually surprise you. 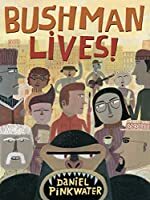 I really enjoyed Bushman Lives and am hopeful that a sequel will be written. The reason that I believe boys and girls in middle school will like it is because it is different, but in a good way. This book will constantly entertain you and will keep your interest. The characters are particularly lively. There are many different characters like None is the chicken man. He has a chicken in a little hat on his head, and it performs for him to make money. The only thing I didn't like about this book was that the chapters, and likewise the book, could have been longer. Overall, Bushman Lives was a very well written book, and I loved it. Review written by Josh (6th grade student). We would like to thank Houghton Mifflin Harcourt for providing a copy of Bushman Lives! for this review. Have you read Bushman Lives!? How would you rate it?